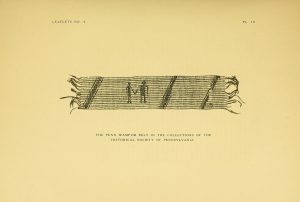 This leaflet describe the wampum belts from the Lenape nation (Delaware) believed to be the original belts presented by the Lenape to William Penn, the founder of Pennsylvania. Tradition says that the belts were an offering from the Lenape as part of a peace treaty between William Penn, founder of Pennsylvania, and Tamanend, a chief of the Lenape in 1683. The treaty was supposed to have taken place in the Lenape village of Shackamaxon on the shore of the Delaware River in what is now Philadelphia. Penn Treaty Park now stands in that location as a memorial to this treaty. 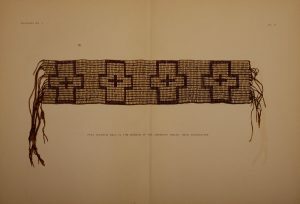 In 1916, Thea Heye acquired the wampum belt with crosses (pictured above) from William Penn’s descendants. She was the wife of George Gustav Heye—noted collector of Native American artifacts and creator of the Museum of the American Indian (which became a part of the Smithsonian in 1989 and still exists as the George Gustav Heye Center in Manhattan). This wampum belt is still part of the National Museum of the American Indian’s collection, though about a third of Heye’s Native American collections have been repatriated. See the leaflet The Penn Wampum Belts by Frank Gouldsmith Speck (1925) in our Digital Library to get a sense of what they surmised after acquiring the belt, along with a detailed explanation of how the belts were constructed. It also includes the history of one other wampum belt—this one depicting a Native American and white man shaking hands, now with the Historical Society of Pennsylvania. Whether the stories about the treaty between the Lenape and William Penn are historically accurate or not, the narrative surrounding this treaty quickly became an important part of early American mythology. No documents beyond the wampums remain as primary documents of this meeting—the many paintings and other depictions of it were based on memories and oral histories. The story of the meeting was recalled for generations of both the European settlers and the Lenape as a sign of warmth and friendship. Regardless of the truth about the meeting, in effect it kept relative peace between the Lenape and early Pennsylvanian colonials—at least until the French and Indian War almost a century later. Some physical examples of this mythology are still around. There is a cultivar of the American Elm called “Penn Treaty”—referring to the large elm in Shackamaxon underneath which they supposedly agreed to the terms of the treaty. Grafts of the elm were taken before it was felled by a storm in 1810 and though rare, some Penn Treaty elms exist today. The wood from the original Penn Treaty elm was even used to create objects and furniture. An obelisk was soon erected where the elm once stood, surrounded by Penn Treaty Park (which is itself the topic of a recent book, The History of Penn Treaty Park). Finally, the treaty is the subject of numerous paintings and other decorative works, including earthenware plates, textiles, and paintings in the National Gallery of Art and the Pennsylvania Academy of Fine Arts (including a well-known one from Benjamin West). 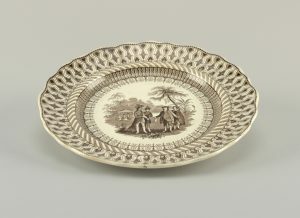 “William Penn’s Treaty” Plate. Cooper Hewitt Smithsonian Design Museum. Object ID 18693381. Visit the Collections Center to see more objects and documents from and about Penn’s Treaty. You can also visit the National Museum of the American Indian for Nation to Nation: Treaties between the United States and American Indian Nations (through 2020) to learn more about the context and consequences of treaties—many of which still have repercussions today.